The holiest of all temples in Bali, the Mother Temple of Pura Besakih is located some 3,000 feet up Gunung Agung in East Bali. This sprawling complex consolidates 23 separate temples, some dating back to the 10th century. 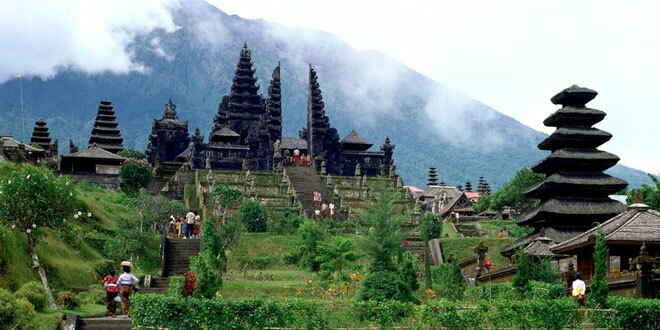 The temple’s main axis aligns with the peak of Gunung Agung, the tallest mountain and holiest site on Bali. Pura Besakih narrowly escaped destruction in 1963, as lava flow from Gunung Agung’s killer eruption missed the temple by mere yards. Today, Pura Besakih is a major draw for tourists and for devout Balinese. Located about a mile south of Tampaksiring, Bali’s “Valley of the Kings” is located in a ravine between ricefields. The Pakerisan river flows through this ravine, and the cliffs flanking the river feature shrines carved into the stone honoring kings and queens from the 11th century. 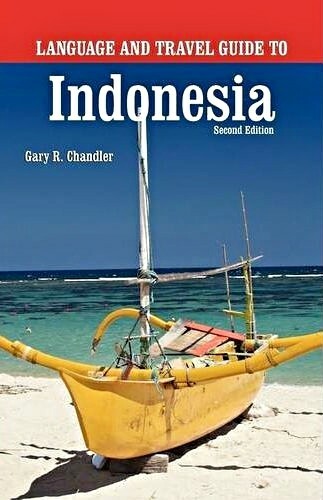 The Balinese – big believers in the holiness of water – believe that the river sanctifies Pura Gunung Kawi. The site isn’t a temple per se, nor is it a tomb – the royalty honored here were likely cremated according to Balinese custom. Legend has it that the god Indra created the spring Tampaksiring (namesake of the nearby town) as an antidote to a poisonous spring created by an evil demon king. 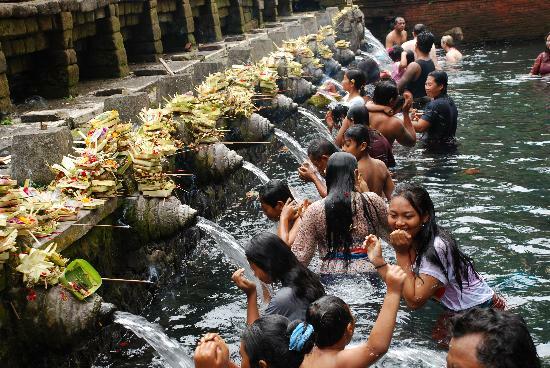 In reality, Tirta Empul was probably built in 926 AD during the Balinese Warmadewa dynasty. A villa complex nearby houses government VIPs; it was originally constructed for former President Sukarno in the 1950s. Known as the Elephant Cave, Goa Gajah seems strangely free from elephants until you realize it takes its name from its proximity to the Elephant River. (Which is also strangely lacking in elephants.) 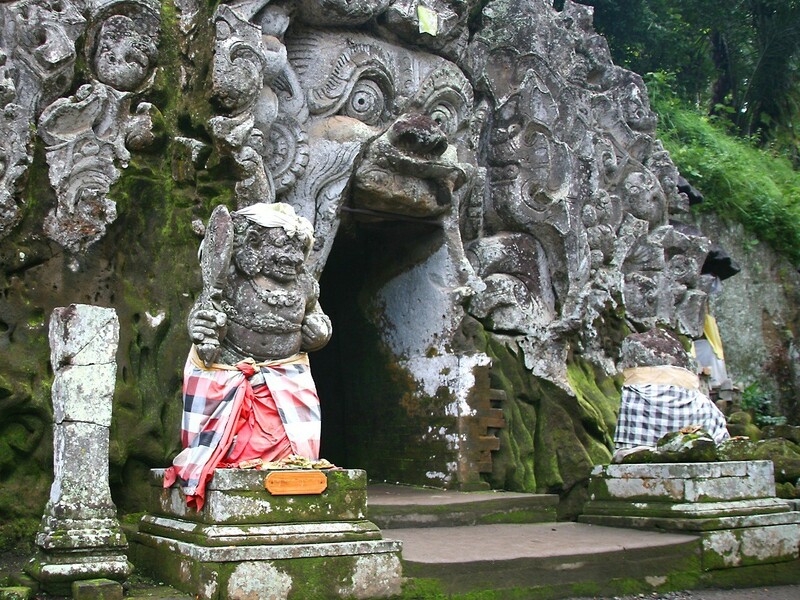 Goa Gajah’s key attraction is the menacing entrance to the cave – the surrounding rock has been carved into a face, mouth agape. The interior of the cave features a statue of the Hindu god Ganesha and a worship area devoted to the Hindu god Shiva. 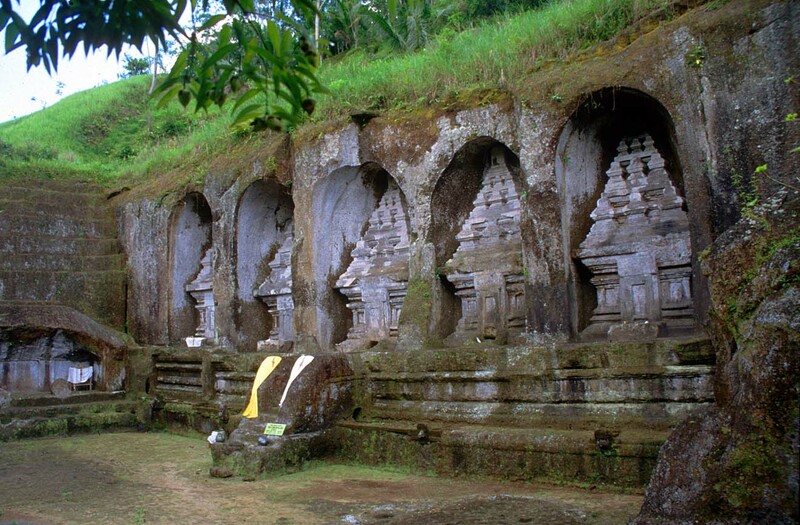 Goa Gajah probably dates back to the 11th century, and is mentioned in a poem that dates back to the 1300s. Perhaps the most frequently featured temple on Bali’s postcards due to its unique offshore setting and sunset backdrops, Tanah Lot also happens to be one of Bali’s most important temples. Tanah Lot stands on a rock some distance from the shore, towering over the sea. Access to the temple is limited to low tide; even so, this picturesque temple is barraged by visitors. As one of Bali’s most popular temples, Tanah Lot is surrounded by crowds and vendors. Do not visit if it’s peace and quiet you’re after, but do come if you’re after a great sunset view. Built in the 1600s by the King of Mengwi, Pura Taman Ayun survives today as a beautiful example of a royal public temple. The descendants of the Mengwi royal family still sponsor the temple, which also serves as the clan kawitantemple (a temple dedicated to the worship of the deified ancestors, in this case the previous rulers of the Mengwi royal family). “Taman Ayun” means “beautiful garden”; a moat surrounds the temple, which gives the complex the appearance of floating on water. A landscaped front courtyard entered through an ornamental candi bentar (split front gate) adds to the temple’s beauty. This temple on the shores of Lake Bratan is second only to Pura Besakih in significance, but for rice farmers in Bali, this temple is the foremost on the island. Pura Ulun Danau Bratan is the primary temple in the many temples and shrines that punctuate the subak irrigation system popular in Bali. 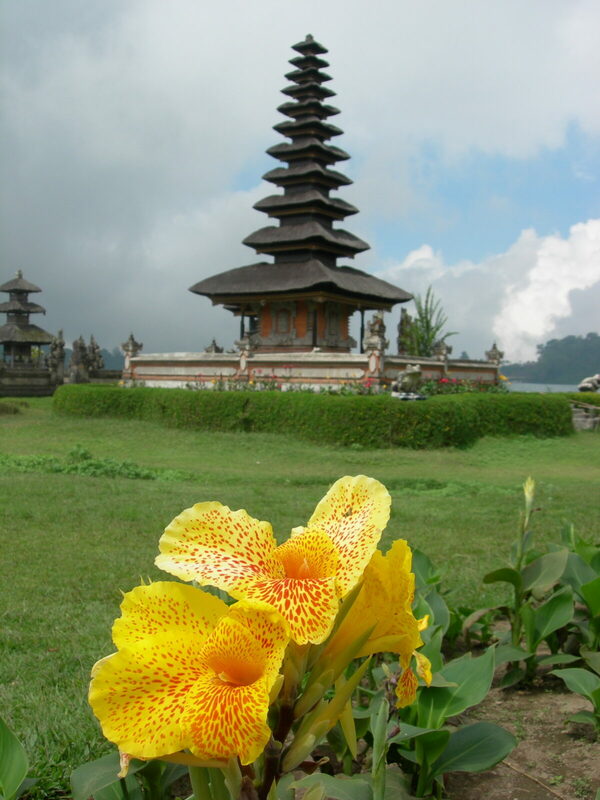 The temple is dedicated to the worship of the goddess of lakes and rivers, Dewi Batari Ulun Danau. Part of the temple is located on the mainland, while a significant section seems to “float” on the lake, being set on an island just off the mainland temple complex. An 11-roof meru (pagoda) sits on the island section, a towering beauty surrounded by a placid lake. Pura Luhur Uluwatu is both a major Balinese temple – one of the six sad kahyangan revered by all Balinese – and the site of a nightly kecak performance that reenacts the Ramayana through chanting men, masked actors and a dramatic fire-dance. Pura Luhur Uluwatu was first constructed by a Javanese Hindu guru in the 10th century. 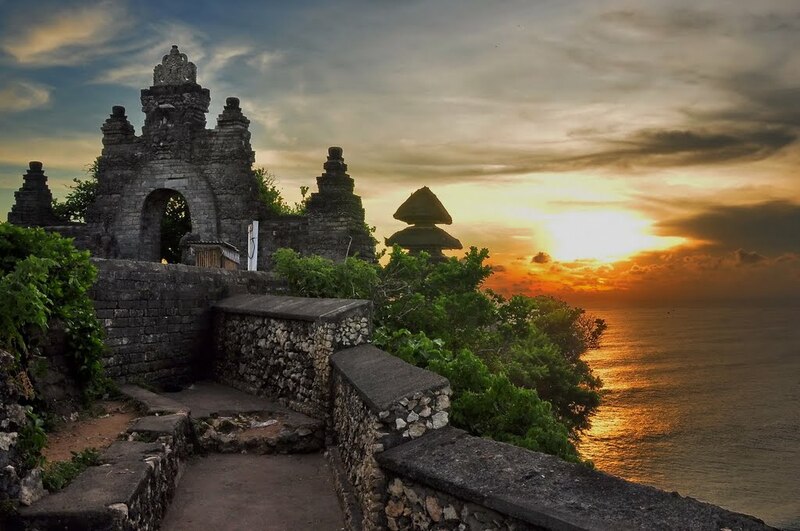 The whole temple stands on a cliff soaring 200 feet above a prime Bali surfing spot in the westernmost part of South Bali – the temple’s name refers to its position “at the head of the rock”, and visitors get an eyeful of the sea as it breaks against the base of the cliffs below. The view is especially beautiful during sunset. The temple of Pura Goa Lawah in East Bali iincludes a cave inhabited by thousands of bats. A black-sand beach nearby makes Goa Lawah a popular site for post-cremation purification, for the Balinese families that can afford it. The Javanese priest Nirartha supposedly visited the cave back in the 15th century. 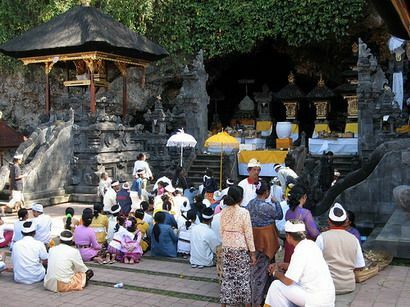 Legend has it that the cave interior extends over 19 miles underground to emerge at Pura Besakih.